Corum Buckingham from the Artisan Collection consists five unique timepieces representing animals and nature. The themes of flowers and birds have always been known as a true challenge for Corum’s master craftsmen because of the various vivid colours and the difficulty of expressing their bright intensity. The delicate luminosity of the wild life enhances the distinctiveness of the mother-of-pearl and creates mystifying timepieces. 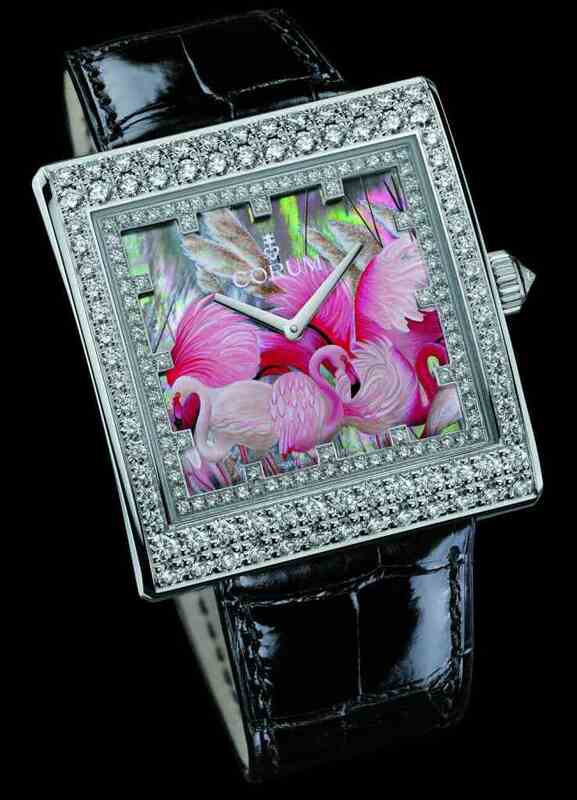 This meticulous painting is accentuated by the marvellous diamond set case. In the 17th century, Geneva, Switzerland was recognized as the major center for watch dials painted in enamel. Watches dating back to the time of Louis XIV reflect some of the fine art emanating from this city. By the middle of the 19th century miniature enamel painting had reached its heyday only to become victim of the modern era. As an exclusive brand, CORUM offers ranges of exceptional quality watches that are innovative, with a distinctive design and dedicated complications and intends to restore this art in watchmaking to its rightful distinction. Since its repositioning in 2005, the brand has been founded on four pillars (The Admiral’s Cup – The Romvlvs – The Golden Bridge – The Artisans). As part of its history as a Swiss watchmaker that stays in the vanguard of designs, CORUM constantly researches new art techniques. CORUM mastered the watchmaking craftsmanship through different artistic techniques that are mainly dedicated to The Artisans and the Golden Bridge collections. When CORUM met André Martinez, a miniaturist residing in Le Locle, Switzerland, this day marked the beginning of a rich relationship with creativity and passion. The art of painting miniatures on a watch dial is similar to the technique used in painting on canvas. The artist works with indelible paints (lacquers) on which he can work over and over again. The colours are applied and mixed on the dial itself, under a microscope using extremely fine brushes. The dial is dried in an oven at 90 degrees Celsius (194 degrees Fahrenheit) between each application, allowing the colours to achieve intense depth and detail. The production time can require from 25 to 30 hours of work depending on the motif. With constant research and development of new art techniques, CORUM introduced to its collection mother-of-pearl dials that are engraved, hand-painted and lacquered. With up to six levels of engraving that produce an unusual relief effect, the procedure includes everal firings and repeated hand polishing. Then, using a very fine brush under a microscope the artisan painstakingly paints the dial that is finally lacquered and hardened. Each dial requires more than 50 hours of work and about 15 intermediate drying processes between the colors. The result becomes a truly magnificent piece of art. Artistic techniques are timeless, stemming from a historical heritage. Each piece enhances a very unique know-how and a very exclusive artwork. If nature and animals are the major topics used in enamel design, the fine watch collectors and connoisseurs can also create their own dial design thus creating their own one-of a-kind piece of art. Born in 1957 at Barcelona in Spain, André Martinez was three and a half years old when he emigrated to the little town of Le Locle in Switzerland with his parents and elder brother. After completing his schooling here, he went on to train for four years at the Art School in La Chaux-de-Fonds from which he graduated in 1978 with a jeweller’s diploma. From a love of his region, because he still lives in Le Locle, he preferred to make practical use of his knowledge in the watchmaking branch. Employed for eight years by a local supplier, André Martinez went on to create his own designs: prototypes of complicated watches and pocket watches for luxury watchmaking brands such as Patek Philippe. In 1985, the talented young Martinez, aged 28, was commissioned by the director of an important dial manufacturing company in La Chaux-de-Fonds, to set up a jewellery department. From the manufacture of the first jewelled dial to responsibility for ten employees in the department, André Martinez qualified as an apprenticeship master in jewellery making and rose to the challenge. In charge of the development of a range of dial making techniques, in the space of barely five years André Martinez positioned the business as the leader among the finest Swiss manufacturers of jewelled dials. The passion for design which inspired André Martinez from childhood, and the desire for independence, encouraged him to decide on a career change. On the strength of the experience gained in making prestige dials, André Martinez opened his own miniaturist’s studio in Le Locle in 1996. In 2002, his meeting with CORUM was to mark the beginning of a fruitful cooperation uniting their passion and creativity. In 2002, André Martinez developed a new technique for relief engraving on mother-of-pearl, on which he took out a world patent in 2003. Since that time, André Martinez creates watch dials with handpainted portraits, animals and art reproductions for CORUM.